Please feel free to call the office at 480.380.5572 to confirm our hours. We’re probably the largest market place in Arizona! There is more to see here than anyone can see in one day! A single breezeway covers a mile and a quarter of shopping lanes. In High Season. 900 merchants stock 1600 shops. The place is enormous. The pace is relaxed, the merchants are friendly, and there are lots of places to sit and people-watch, too. Mesa Market Place Swap Meet is 100% handicap accessible, and scooter and chair rentals are available. Lots of restrooms, too. Whether you are an avid shopper, or just want to slow down to enjoy the ambiance, there’s plenty to do. You’re welcome to listen in on some great live music in the Food Court in the middle of the market. Enjoy a beer, a meal, a sandwich, or a smoothie there, too. We’ve got an awesome Food Court and Snack Bars! We serve breakfast from 7:00 a.m. to 10:30 a.m., and transition to lunch, pizza, deli sandwiches and snacks after that until closing. Our Market Breakfast, includes two eggs, toast, and hash browns. Smoothies, breakfast burritos and lots of side choices are also available. Our hot cheese steak Philly sandwich and our beef gyros run about $5 and are favorite lunch staples. We also serve deli sandwiches, pizza, and salads. And what’s more fun than enjoying a Coors beer, soda, or fruit juice while listening to live music in the Food Court, or while strolling the market? We’re one of the most popular shopping venues for locals and a ‘must-see’ for out-of-towners! Souvenir shopping is a must-do for most vacationers, and we’ve got traditional, unusual, and even one-of-a-kind finds in all price ranges from just a few dollars ranging up to museum-quality pottery and jewelry pieces costing thousands of dollars. Locals love Mesa Market Place Swap Meet, too! 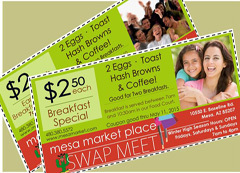 The Mesa Market Place Swap Meet is a perfect place to take the whole family. 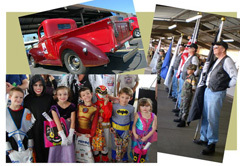 We have food, entertainment and some of the best bargains in the East Valley. All this, while you enjoy the beautiful scenery of the Arizona Desert just beneath the Superstition Mountains. Locals are always amazed at the incredible selection and bargains they find at the Mesa Market Place Swap Meet. Our merchants seem to offer it all! We’re looking like the best place for shoes, sandals, clothing, dresses, and accessories like jewelry, scarves, purses, sunglasses, and belts. You’ll also find: home furnishings, clothing, memorabilia, jewelry, toys, collectibles, silk plants, perfumes and cosmetics, food, books, Native American treasures, southwest décor , tools and much, much more! Best of all, tourists and locals, alike, find incredible bargains in a fun and recreational-shopping kind of place! If you are looking for a day of fun under shaded breezeways, then you have found the right place. Our merchants’ shops are engaging and personalized. The hunt for the right souvenirs will be like a Treasure Hunt, satisfying your passengers that their time was well spent.